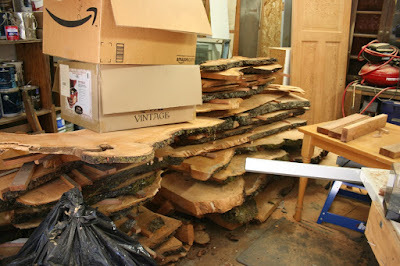 It's been 3.5 years and we haven't done anything with this huge pile of cherry wood. We need to dig some space out of the garage so we've decided to sell this wood. Do any of our followers have any clue what kind of price we should ask on craigslist? We have finally almost unburied ourselves of the huge pile of tile we bought in 2015. We used the subway tile in the bathroom and after months of listings, we've managed to sell most of the colored trim tiles. Whatever is left at this point will probably get donated to The Rebuilding Center or I'll put a free ad on craigslist. 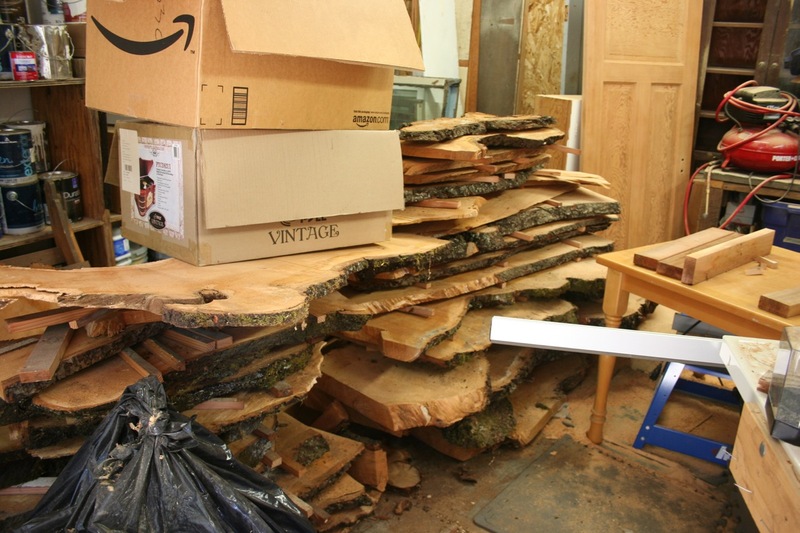 You might check with local hardwood or woodworking suppliers to see what they're selling similar material for, then list yours at 75% of that or so. Your cherry looks very interesting!!!! How thick are the pieces? We would love to take a look. Please let me know when you have decided on pricing. Most of the pieces are 2" thick. Some are a little thinner. Are you local? You could come take a look. We are in North Portland. We would love to come and have a look. I have some painted pieces of tile in various colors as well as some hex tiles (I think). We have some rose trim pieces and lots of misc colors in small amounts. I've actually got quite a lot of those bits free, if you want them. OMG I wish I were A: nearer, and B: not broke, because I'd LOVE to buy a bunch of cherry. It's generally one of the more expensive domestic hardwoods, as from what I can remember it was roughly 6-8$ per board foot. A board foot is 12x12x1, so if the wood is thicker or thinner than 1 inch you have to factor that in to the calculations. Price also depends on whether it's kil dried, air dried, and whether it's surfaced on 2 sides or 4 sides. Your boards look like rough sawn air dried with live edges, so basically zero surfacing. Not sure how much you could ask. I'd say at least 5$ per square foot. Are you still selling your tile? Most of the large quantities of tile have been used in our bathroom or were sold. I think we have some hex tile left and maybe rose colored pencil trim tile for sale. And we've got quite a few misc tiles for free. Hi -- I found your site by accident. Pinterest referred me to a photo you had and I then realized you are in Portland. I love what you are doing with your home. There is something you may want or even need or even need to finish your home. We have an original Laurelhurst book, printed in the beginning of the 20th century. I was made for buyers (and dreamers). There are photos, sketches and plans for many of the homes that were built, and plans for some that were not in yet. Only about about 20% of the lots were built At the time the book was printed. Lots of the interior illustrations are shown decorated, you may find that missing idea that you have been trying to figure out. It looks strange to see the streets with no trees yet! and the houses with no landscaping. The book explains the philosophy of the area, the street cars, the club and pool, and all the other amenities of the time and place. Everything was done with the Craftsman philosophies in mind; There are some big differences in the Pacific Northwest Craftsman and those in the Mid-west, East and Southern California. Until I lived in this area, I had only seen those others and ours here is very unique. This book is definitely made for selling homes and lots, the architects and developers wrote and printed it. Someone in Laurelhurst should have this. I was ready to drive around and find the picture on the front and see if that person wanted it, but I wanted it to be appreciated. You, or someone like you, should have this book. Let me know. I will keep photo a photo copy of the book for my reference library, but I am not the right one for the book. Hi Louise, I would be delighted to have a good book about Laurelhurst. I would do what I could to make sure it gets into the right hands here too. You can contact me via email at ebaygal at thekidders dot com.